Modern textile industry is a growing and successful market. International cooperation makes it possible to meet the rising expectations of customers for high quality and affordable clothing in full. 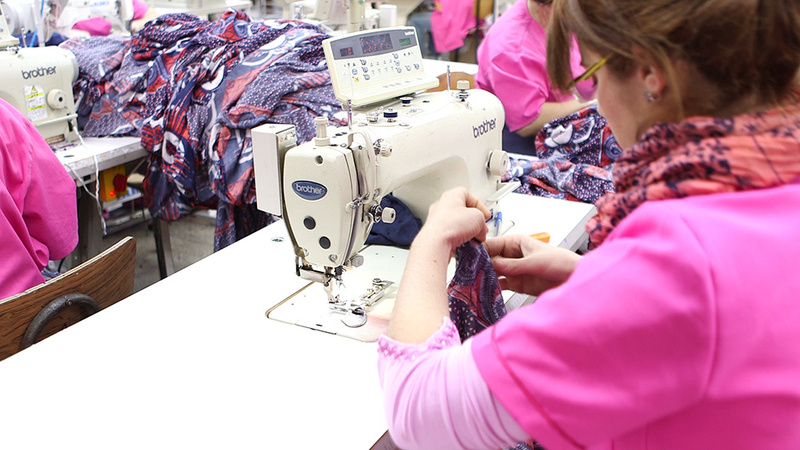 Romanita is one of the largest and technologically most advanced sewing factories today. Located in Caracal - in southern Romania - for several decades Romanita has been a highly valued and reliable partner to many international brands. H & M and Primark are just two of the many long-standing customers of Romanita. The long list of companies and their brands working with Romanita also includes such names as Jon Adam with its brands Tesco and Asda, as well as Inditex with the brands Zara, Massimo Dutti and berska. • Well equipped work stations in conjunction with excellently trained and experienced personnel provide consistently a high production capacity. • of different design, diverse confections and various complexity. • The success is a reliable and timely completion of orders in both small as well as large order volume. safe and thorough way of working. • Very special attention is given to details. • Whether it is playful lady wear or sturdy winter jackets, every seam, every hem, every clasp is precisely checked before the entire garment is delivered to the customer. • The result are products that always meet the highest expectations of customers entirely. • Romania is known for its balanced and convincing price-performance ratio. • Top quality garments can be made at comparatively low production costs. • These are the garments of the highest quality that are manufactured using the latest technologies under of strictest security guidelines. • This results in satisfied customers who always receive the very best clothes at the highest quality for their money. Romanita appreciates the stable partnerships with its customers. Therefore Romanita invests repeatedly in the further expansion of its production capacities to meet the growing demand for high quality garments at low production costs. You are not yet a partner of Romanita but wish for your customers high quality clothing, with which you can conquer the next season by storm? Contact us! A lucrative and valuable partnership will be the result. “Romanita’s success is due to our team’s loyalty and enthusiasm, giving the fact that our company is constantly at its client’s convenience. Therefore, our main objective is to always build partnerships that are beneficial for both sides. We are trying hard to reach perfection and we strongly believe in Romanita’s future. What sets Romanita apart on the international market is the respect we have for our clients, the special attention we pay to every single detail and our main concern to emphasize on the quality of the products. The Caracal knitting factory began its activity on the 27th of January 1927. In 1990 the factory changes its name to Romanita Trading Company according to the Romanian Govern decision nr. 1254/4.12. In 1995 the factory was completely privatized. Romanita trading company produced and merchandized knitted and light fabric apparel and lingerie. Starting with the year of 1999 Romanita stopped producing for the local market shifting its focus and resources towards the foreign one, where the company adapted to the FOB and LOHN working systems. Starting with 1998 the factory went through a modernization process and was therefore brought to the international standards of production and storage. As a consequence, the production departments were equipped with new, improved engines to meet thehighest requirements of quality, brightness, comfort and labour protection. After 35 years of activity, Romanita finds itself among the top Romanian textile garments producers. Romanita tried its best form the very beginning in 1972, investing effort to always keep up with high quality standard, respecting its client’s values and expectation. As a result of this constant will to improve the factory achieved these next certificates: ISO 9001:2008/27.09.2010 , ISO 14001:2005/27.09.2010 and OHSAS 18001:2008 /27.09.2010.